This is a classic example of a badly parked forklift. Forks are a serious tripping hazard for everybody. You an easily break your ankle or be cut by incorrectly positioned fork tips. 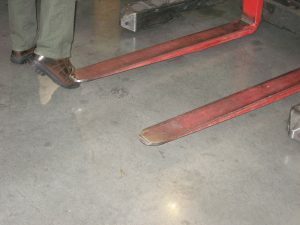 All forklift training programs must cover correct parking and shutdown procedures. And guess who most often falls over the forks – the operator!